env_review/53_west_53.shtml. New York City Department of City Planning. 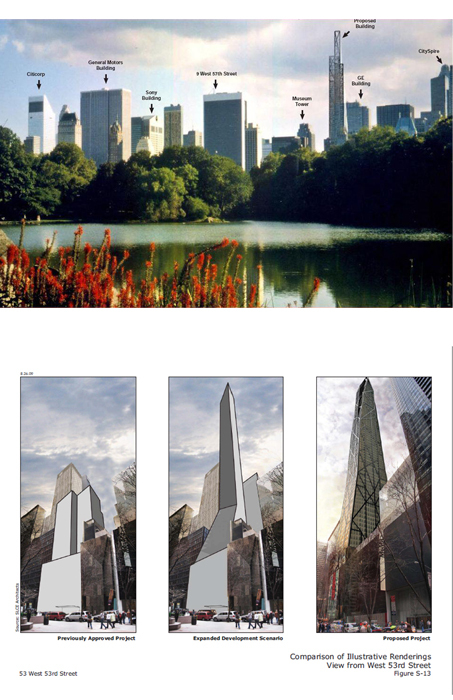 Designed by the acclaimed French architect Jean Nouvel, the MoMA Tower, which his studio named Tour Verre, successfully made its way through the review process of the City Planning Commission in the summer of 2009, although with a reduction of height from the original proposal for 1,250 ft., which was cut down to 1,050 ft. The project was halted, however, by the severe recession in financial markets that effectively ended all real estate lending. The project has revived in recent months. 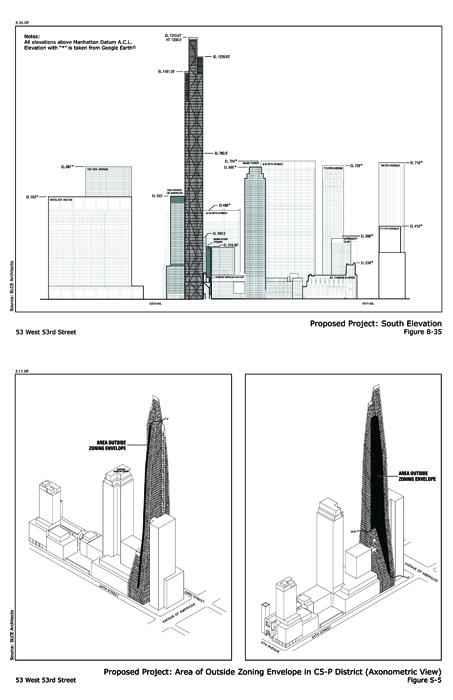 The drawings and diagrams at the right, printed from pubic documents filed in the Environmental Impact Statement (EIS) and submitted as part of the review process of the City Planning Commission, illustrate three variations of the tower: the massing based on compliance with the as-of-right zoning; the building with extra air rights purchased from adjacent properties; and the "Expanded Development Proposal" that added both height and some modest girth to the tower using the additional FAR to increase the size of the floor plates beyond the "sky-exposure plane" of the zoning envelope, thus triggering the public review process.